Tokyo (VNA) – Japanese Prime Minister Shinzo Abe expressed his willingness to strengthen economic and security ties with the Philippines during talks with Philippine President Rodrigo Duterte in Tokyo, Japan, on October 26. 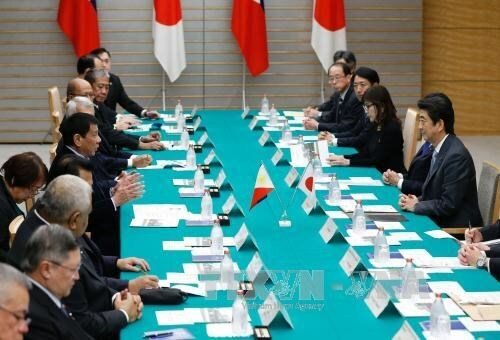 The two sides have agreed to specific support, including Japan’s provision of loans in Japanese yen to the Philippines to support slow growing localities. Japan will also provide the Philippines with two patrol ships to boost its defence capacity at sea. At a joint press conference after the talks, PM Abe said the two sides agreed on the importance of the peaceful settlement of disputes at sea.